Many claimants have described a “revolving door” process of endless assessment, ceased Employment Support Allowance (ESA) claim, (based on an outcome of almost invariably being wrongly “assessed” as fit for work), appeal, successful appeal outcome, benefit reinstated, only to find just 3 months later another assessment is required. The uncertainty and loss of even basic security that this process creates, leading to constant fear and anxiety, is having a damaging, negative impact on the health and well-being of so many. A significant proportion of those required to have endless assessments have very obviously serious illnesses such as cancer, kidney failure, lung disease, heart disease, severe and life threatening chronic conditions such as multiple sclerosis, lupus, myalgic encephalomyelitis, rheumatoid arthritis, brain tumours, severe heart conditions, and severe mental health illness, for example. To qualify for ESA, the claimant must provide a note from a doctor stating that the person is unfit for work. There can be no justification for subjecting people who are so ill to further endless assessments, and to treating us as if we have done something wrong. 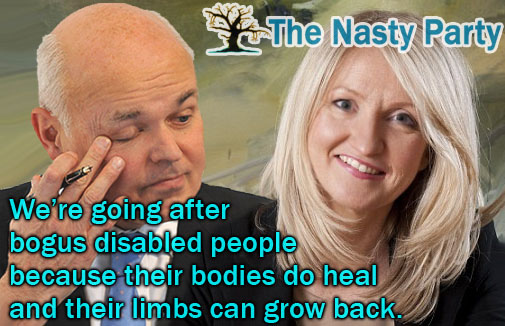 In addition to very justified anxieties regarding the marked increase in disability hate crime that the Tory-led propaganda campaign has resulted in, many sick and disabled people have also stated that they feel harassed and bullied by the Department of Work and Pensions and Atos. Many talk of the dread they feel when they see the brown Atos envelope containing the ESA50 form arrive through the letter box. The strain of constantly fighting for ESA entitlement and perpetually having to prove that we are a “deserving” and “genuine” sick and disabled person is clearly taking a toll on so many people’s health and well being. Many families of those who have died have said that the constant strain, anxiety and stress of this revolving door process has contributed significantly to their loved ones’ decline in health and subsequent death. The figures from the DWP, and the marked contrast between the ESA and IB death statistics certainly substantiate these claims. Leonard Cheshire, a charity that works with disabled people, surveyed 350 people who had been through the workplace capability assessment, which is used to establish whether benefit claimants are well enough to return to work. More than six in 10 (65 per cent) of those who had gone through the process said they had ended up with more pain afterwards. Almost three quarters (72 per cent) said they found the assessment had a negative impact on their mental or physical health, or both. The same number described the face to face appointment as very stressful. A teacher who was medically retired in 2011 due to progressive rheumatoid arthritis, said she left her appointment “feeling absolutely awful and suffered a lot of pain in the following days”. She went on to suffer a stroke a few weeks later, and believes the experience of undertaking a work fitness assessment was a contributing factor. “This isn’t acceptable and no test should put someone through something that makes their condition worse. Two thirds disagreed with the outcome of their assessment. The research relates to the period during which the private company Atos was responsible for carrying out the assessments. Its work has ended after it pulled out of a government contract to manage disability claims early, and the American company Maximus has taken over delivery of the assessments from 1 March 2015. The charity is calling on Maximus to take the findings of its survey into account when redesigning the fitness for work assessment process. It wants to see staff trained in specific medical conditions, (as most Atos assessors are non-specialised nurses or occupational therapists,) physical examinations restricted to cases of absolute necessity and for claimants to be aware they can say no to an examination if it will cause them pain. We know this to be untrue because of the high numbers of people needing to challenge wrong decisions. One such person is Sharon Majek, 57, from Rugby, who has been unable to work since her mid-thirties after suffering a serious injury at work. She stopped an elderly patient from falling out of bed badly hurting her back. She was diagnosed with osteoarthritis, degenerative disk disease and fibromyalgia, leaving her in constant joint pain and with limited sensation in her hands. Ms Majek was found fit for work so she asked to see a copy of her report, which she and her husband described as unrecognisable from the meeting they had attended. The decision was overturned at appeal. This is a very common and unacceptable experience amongst people claiming ESA. What you need to know about Atos assessments. I didn’t do too badly during my assessment but I believe that was only because the session was recorded; I was apparently the first to do this due to having a degree qualification and professional equipment/software. That said, they made me wait 2 1/2 hours for an appointment as no doctor would agree to be recorded; I reminded them that this had already been previously agreed and it was my right. When one doctor finally agreed, she asked for a chaperone!! I was totally shocked by that. What happened afterwards though was the salient point: a deep depression and suicidal feelings for the next 3 1/2 years due to fearing reassessment: I feel completely robbed by this. I did receive another ESA 50 3 years after my first assessment, but I was never told that I was granted ESA for 3 years in the first place. I filled the form in, and 2 years later I’ve still not heard anything, so I presume that I was granted this for another 3 years, but I was never informed. Never knowing where you stand, and being afraid of ringing up to find out, is part of the terrorizing experience of being a claimant. I’ve had therapy for extreme anxiety due to this, and I have to keep referring back to the skills that Iearned on a regular basis. Nevertheless, I’ve recently felt so traumatised by the thought that the tory’s would gain power in May, that I’ve contemplated suicide again; I can’t seem to get it out of my mind. I’m so physically ill that I cannot keep fearing the brown envelope or a phone call: it is killing me little by little in any case I believe. Ironically, I can call myself ‘one of the lucky ones’: I haven’t had to go through appeal and risk further compounding of my ill health due to hunger, cold and homelessness; I even appealed and won back bedroom tax for my box room. But it’s the fear you see, that you too at any time could end up like that. 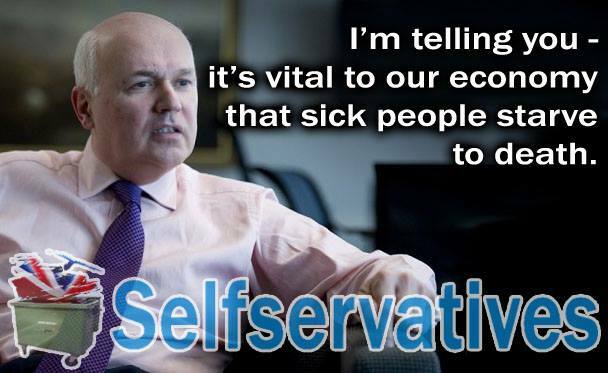 I truly believe that if the tory’s gain power again, I will lose my home and possibly my life. Being in fear of your very life is no way for anyone – let the chronically sick – to lead their ‘lives’. Yes, I also asked for the 2nd assessment to be recorded, as the assessor’s report for the 1st was a pile of made-up ninsense, bearing no resemblance to my my account or real life. I won an appeal though, but it was 9 months later, leaving me struggling financially for that period of waiting for some justice. 3 months after I won, I was sent another assessment appointment … but the recorded interview made a big difference. The assessor was sympathetic this time, and importantly, honest in his report. I was placed in the support group at his recommendation this time.